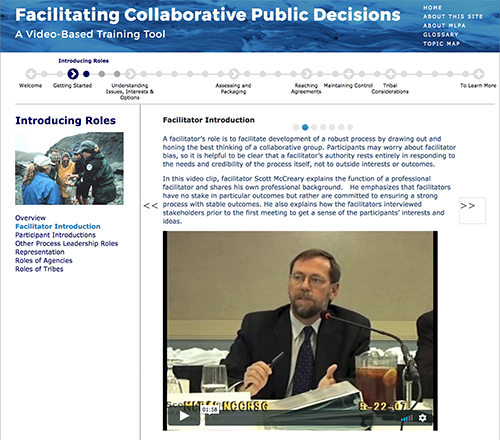 This interactive website presents a stepwise process for facilitating collaborative decision making, incorporating video clips from the eight-year California marine protected areas process. Stakeholders, facilitators, agency officials, and students will find this tool a valuable resource to build skills and better understand collaborative efforts. 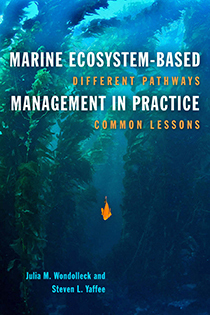 Marine Ecosystem-Based Management in Practice is the first practical guide for the marine conservation realm. In a unique collection of case studies, the authors showcase successful collaborative approaches to ecosystem-based management. This website presents 60 case studies and cross-cutting lessons of Marine Ecosystem-Based Management (MEBM). MEBM seeks to manage marine resources in ways that protect ecosystem health while providing the ecosystem services needed by people. Rather than focusing solely on a single species or resource, MEBM incorporates science and balances the demands of user groups to create management strategies that are more likely to be sustainable than traditional approaches. Recent Reports: NERRS Science Collaborative Projects Assessment Lessons learned about collaborative science in the National Estuarine Research Reserve System. Fellowships: EMI administers the Wyss Scholars Program and we are currently in the process of selecting the 2017-2019 cohort. Resources: Download the Evaluation Sourcebook, a ready reference of ecological, socio-economic, and organizational progress measures. Research: Read about our featured research on the Resource Legacy Fund's Preserving Wild California Program, as well as recent EMI-supported Master's Projects about Collaborative Forest Restoration, Coastal Community Resilience in Oregon, Renewable Energy in California, and Corn Ethanol and Wildlife. Read lessons learned and case studies from collaborative natural resource partnerships around the country.